While living without a functioning dryer may not be the worst problem that could hit your household, it can certainly be a burden. Who has the time to haul around piles of wet laundry or hang each and every item up to dry? If the number of hours you spend doing laundry is already high enough, don’t put off professional dryer repair one moment longer than necessary. When your dryer’s on the fritz, there’s one sure way to end the frustration in a hurry: Call Alliance Appliance. Our family-owned company understands the inconvenience of a broken clothes dryer, and we’re dedicated to providing first-rate washer/dryer repair services for your Milwaukee-area home. Reach us today by phone or email! If your dryer repair involves any of these performance problems, or another type of issue, please don’t hesitate to contact our qualified professionals. Alliance Appliance can troubleshoot, diagnose, and resolve the ailments specific to your unit through our fast and affordable clothes dryer repairs. We’ll work on any make or model of residential clothes dryer, gas or electric. Best of all, our specialists are devoted to efficient, cost-effective washer/dryer repair so we can pinpoint the problem and get it taken care of in next to no time. We even back our first-class craftsmanship with a six-month labor warranty. While referring to your dryer repair manual and attempting DIY maintenance might seem like an easy way to save money, it could actually end up costing you more in the long run. As with many types of appliance repairs, clothes dryer repair is usually a bit too involved for the average homeowner, posing potential dangers such as gas leaks and fire hazards. 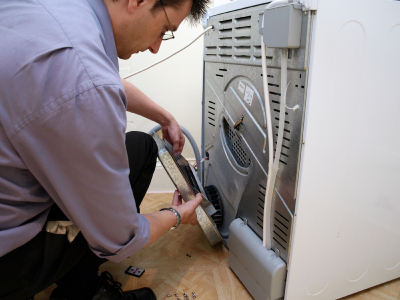 Not only will you have to take the appliance apart to diagnose and address the problem, but you’ll also have to put all of the pieces back together with precision in order for the dryer to function. That’s why Alliance Appliance is your best solution to safe and effective home dryer repairs. Our pros have the training to identify any broken components, make the necessary adjustments, and disassemble and reassemble your appliance with ease. We also offer some of the lowest prices around on dryer repair, so you’ll stay safe and sound by calling our quick, skillful technicians. Don’t endure the loss of your dryer’s convenience in your home. For fast and affordable dryer repair, call or email Alliance Appliance today. We’re right here in Milwaukee to help, and we’re fully insured for your complete protection.